Date posted: June 5, 2014 by: JasonDarkX2 Category: Gaming Tech 2 comments. 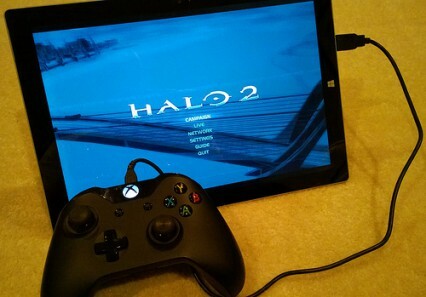 Fresh out the oven this morning is a set of wired Xbox One Controller PC Drivers made available by our beloved Major Nelson(Post) accompanied with a photo of a Xbox One controller hooked up to a Windows 8 Tablet running Halo 2 Vista. Does bring up the question Why bring Xbox One controller PC support now, with E3 just around the corner? Since the most Hated DRM Games for Windows Live (GFWL) is ending its life support on July 1,2014. They’ll be releasing Xbox One and PC only exclusives. They’re trying to sell more Xbox One controller. "As if I don't already have enough 360 controllers laying around." They’re bringing a surprise GWFL version 9000, now featuring Xbox live subscription on PC again. "Surely not, but hey anything is possible." They’re releasing a re-mastered version of every Halo game onto xbox One and maybe PC.... "I'll probably scream in joy if they did either or." They’ll be introducing PC Kinect drivers too, so you tell your PC, "PC on!". That’s enough speculation for now. We’re just going to have to wait for the Microsoft E3 press conference next week for the juicy stuff. It’s time to go steal a friend Xbox One controller and start playing every game with it like a next-gen console until it blows up. At least now we can get some use out of Xbox One controller until real next-gen game releases later this year.But for now simply plug in a XBone controller to a PC and away we go. I just hope there’s a wireless one soon too. GFWL isn’t dead yet, it’s only job was to die and it fail at it too lmao.